Pianist Nic Gerpe, a Los Angeles native, has been hailed as “magnetic” (Dan Johnson, L.A. Downtown News) and “prodigious… heroic” (Kevin McMahon, silverlakeblvd.com). L.A. Times music critic Mark Swed described his playing as “wonderfully illuminating… his tone is crystalline. His technique is dazzlingly fluid.” A dedicated proponent of new music, Nic has worked with composers such as Steve Reich, Gernot Wolfgang, Anne LeBaron, Krzesimir Debski, Michael Gordon and Don Crockett, and has given numerous world premieres in the Los Angeles area and abroad. 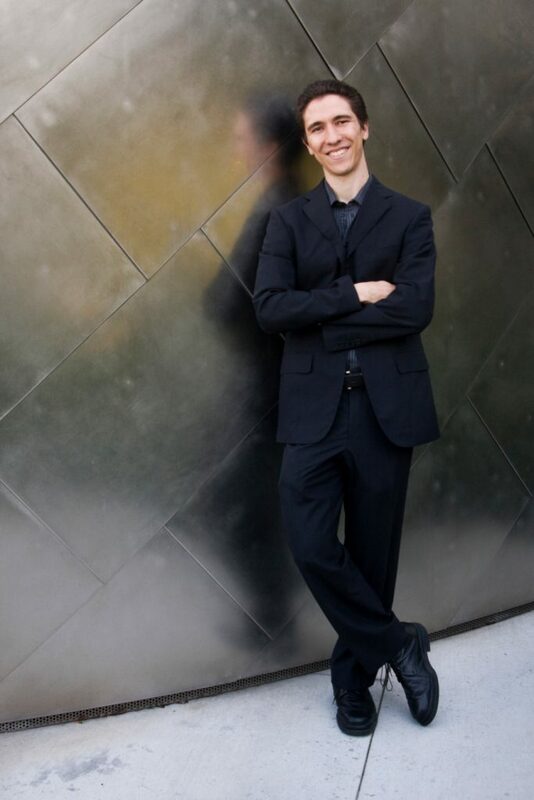 Nic has performed throughout Southern California and at festivals including the Beverly Hills International Music Festival, Banff International Keyboard Festival, the Summer Institute for Contemporary Performance Practice at the New England Conservatory, and the Tahoe Chamber Music Festival. Nic has performed in such venues as Walt Disney Concert Hall, Zipper Hall, the Wallis Annenberg Center for the Performing Arts, and the Roy and Edna Disney Cal Arts Theater. Nic’s performances have also been nationally broadcast on 91.5 KUSC and classicalkusc.org. As one of four young pianists featured in L.A.-based Piano Spheres’ new Satellite Series, Nic recently performed a critically-acclaimed solo recital at the Roy And Edna Disney Cal Arts Theater. He also gave the world premiere of James Matheson’s “Chapter 1…” at Walt Disney Concert Hall as part of the Radical Light Tribute Concert for Steven Stucky. Nic has performed as a soloist in modern piano concerti by some of today’s most talented emerging composers. He gave the World Premiere composer Dale Trumbore’s piano concerto “10,000 Hours” with the USC Thornton Symphony Orchestra, under the baton of Donald Crockett. He also participated in the 2012 Piatigorsky International CelloFest, performing the American premiere of Thomas Demenga’s “Relations”, a double concerto for two cellos, percussion and prepared piano. He also recently performed Reena Esmail’s “Earth Speaks”, a concerto for piano, horn and SATB chorus, with the Pasadena Master Chorale, conducted by Jeffrey Bernstein. Nic has performed with Los Angeles-based new music groups WildUP and The Industry L.A., and premiered new works for Magnetic Resonator Piano with People Inside Electronics. He has performed with such world-renowned artists as Andrew Bain, Michele Zukovsky, Jack van Geem and Judith Farmer. Nic’s playing is also featured on composer Gernot Wolfgang’s most recent chamber music album “Passing Through”, released in 2016 on the Albany Label. Additionally, Nic has given guest artist recitals and masterclasses at California State University Los Angeles, Pasadena City College, and Los Angeles Valley College. Along with violinist Pasha Tseitlin, Nic is the co-founder of “Panic Duo,” a violin and piano duo dedicated to the performance of contemporary music. The Duo has performed in Los Angeles, San Diego, Escondido, Paso Robles and other venues throughout the United States. Panic Duo performed the opening concert of the 2013 Paderewski Festival in Paso Robles, CA, to great acclaim. They “wowed the audience… the Festival opened with thunderous applause” (Scott Brennan, Paso Robles Daily News), and “played with great bravado, passion and skill” (Krysta Close, USC Polish Music Center). The Duo gave the World Premiere performance of Krzesimir Debski’s Sonata for Violin and Piano at the 2013 Paderewski Lecture Recital in Los Angeles. The Duo also gave the World Premiere of Juhi Bansal’s “An Imaginary Thing” for violin and piano. Panic Duo was recently honored by the Senate of the State of California for its performance in a benefit concert for Our Lady of Angels Church in San Diego, CA. The Duo has also premiered works by Michael Patterson, Ed Neumeister, and Bevan Manson. Nic earned his Doctor of Musical Arts Degree in Piano Performance at the University of Southern California in 2012. He studied extensively with Bernadene Blaha, Kevin Fitz-Gerald and Stewart Gordon. He has also worked with Earl Wild, Arnold Steinhardt, Robert Lipsett, and Stephen Drury. Nic has been on the Piano Faculty of the Pasadena Conservatory of Music since 2006.